Clams are a delicious form of seafood, but cooking them at home can be a little intimidating at first. You'll want to know how to prepare fresh clams, discover the secrets to shucking them, and learn how to properly cook these mollusks, so they don't end up tasting like shoe leather. It's really not as difficult as it sounds. Learn all you need to know about cooking fresh clams and check out some popular clam dish recipes. The first step is to clean your clams. Scrub the outside of the clams thoroughly with a stiff brush. Since clams naturally burrow in the sand, they need to be purged of grit. Eating grains of sand will certainly diminish your dining enjoyment. To remove the sand before cooking, cover the clams with a salt water solution of 1/3 cup salt to 1 gallon of water. Let the clams sit in the water for several hours. Adding 1/4 to 1/2 cup of cornmeal helps expel the dark matter and sand from the clams' stomachs and can also whiten the meat. If you plan to shuck the clams yourself, the shells will be easier to open if you freeze them for 15 to 20 minutes. Then, remove the clams from the freezer and let them sit for a few minutes before trying to pry open the shells. As the clams warm up, the muscles relax, and the shells will open slightly so you can get your clam knife inside. Remember to shuck over a bowl to save all that wonderful juice—the clam liquor. You may also want to remove the tough skin covering the neck of longneck clams. Slit the skin lengthwise and remove it. You can ground the skin and add it to chowder or creamed clam dishes. Once your clams are cleaned, you're ready to eat or cook them. The smallest clams are the most desirable for eating raw. The larger the clams are, the tougher the meat will be. Cooking clams can be tricky, but it's quick and not a difficult task. Whole clams have finished cooking when the shell opens. If the shell does not open after cooking, discard the clam. This tells you that the clam was not alive and that it may be contaminated with bacteria or toxins (this also applies to oysters and mussels). Do not overcook clams or the meat will be like eating shoe leather. Add them to the heat at the last minute and cook gently over low heat. The longer the clams are on heat, the tougher the meat will become. If you are making white clam chowder, to get tender clams, soak the clams in milk or cream (whichever is specified in the recipe) and add them last along with the cream. Cook only until the clams are heated through; do not boil. Larger clam shells can be boiled and scrubbed to use as unique serving bowls. As with most types of seafood, it's important that you know some basic facts about clams and the many varieties of clams to choose from. Also, you need to know how to select the best clams and properly store them at home. Properly-handled fresh live clams will last two days in the refrigerator under optimum conditions. If you enjoy digging for your own clams, make sure that you know how to avoid paralytic shellfish poisoning (PSP). This is a potentially fatal marine biotoxin (one clam is all it takes) that is present on both coasts of the United States. 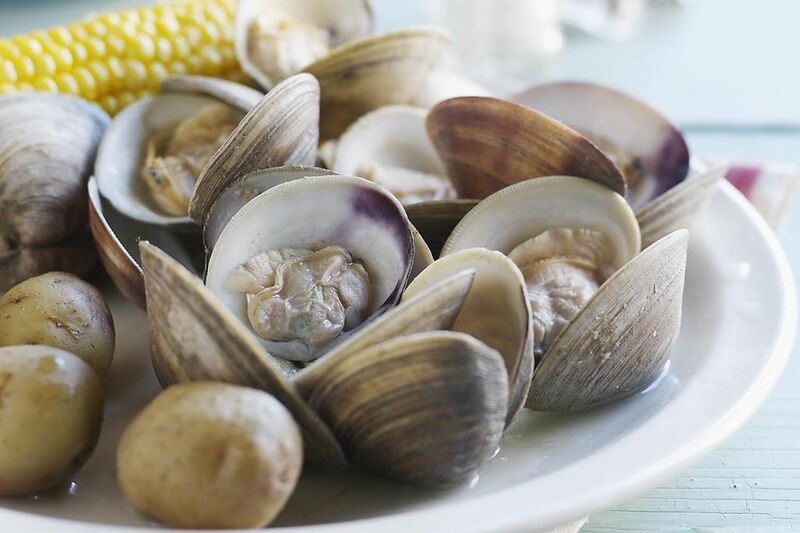 While commercially sold clams and seafood are inspected, you need to take proper safety precautions before clamming on your own—the best advice is to check with your local marine fishery government agency. For example, waters affected by red tide are usually at higher risk for carrying this deadly toxin. Signature clam dishes include New England clam chowder and Manhattan clam chowder. These are perfect recipes for those large clams you did not want to eat raw and great comfort food on colder nights. Fried clam fritters (also known as fannie daddies and boat-steerers) and clams casino with tempting ingredients like bacon, butter, and red bell pepper are two more American favorites. When you're in the mood for a seafood stew, try cioppino, which originated in San Francisco. A recipe of Italian-American heritage is clams posillipo in which clams and other seafood are cooked with garlic, red peppers, tomatoes, and seasoning. Keep in mind that clams may be substituted in most oyster, scallop, and mussel recipes, and vice versa. You'll want to understand how to adjust recipes and brush up on clam measurements, equivalents, and substitutions. This should open up a great variety of cooking options with your new found knowledge of preparing clams.